So Shay: That little blue box could be YOURS! :) $400 GIVEAWAY! That little blue box could be YOURS! :) $400 GIVEAWAY! 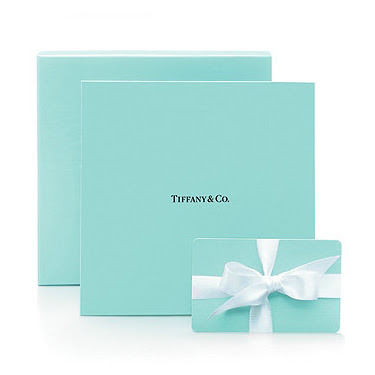 There is just one mandatory entry and that is to leave a comment below telling me "what would you buy at Tiffany's with the gift card". The rest are bonus entries and totally up to you! ShareThat little blue box could be YOURS! :) $400 GIVEAWAY! This is the best giveaway I've seen in a while! There are so many things I'd want to buy, but I think I'd just end up going with a simple necklace like the twist bow pendant! Oh my goodness!!! I can't decide what I'd buy. A necklace or a ring...there's way too many pretty choices. something - anything! i don't own anything tiffanys!! great giveaway - thank you!! I would buy anything pretty!! I dont have anything from Tiffany's! I've always wanted a Tiffany bracelet! The anchor bracelet is my fave! I lost one of my Tiffany's knot earrings two weeks ago, so I would definitely replace those! I don't own anything Tiffany's so I'd use the card to buy just about anything! Probably either a necklace or earrings! I would be so excited to actually go into a Tiffany & Co and by something. I would buy the Elsa Peretti letter pendant in my son's initial or the Tiffany Beads necklace in silver. So many choices! i haven't been in tiffany's for awhile, but i always loved the atlas collection - would love to get a necklace. I'd love a simple, classic bracelet. I would buy the ring I have been eying for a while now! Defiently would have to be some bling!! I would get the infinity symbol necklace and a heart key chain to update the one I've had for over 10 years! I would a necklace, something timeless that I could pass down to my daughter! I don't own at Tiffany's so I am overwhelmed at the thought that I could buy something..probably a ring or earrings, something that I can wear alot. Ohhh I adore the Villa Paloma flower pendant, and you can't go wrong with the silver bead bracelet with the cute bow charm! love all of their necklaces. it would be a tough choice! I would have to go with a bracelet for sure. so many choices.. maybe one of the heart rings! I would totally buy a new charm bracelet!! What a great giveaway!! I would totally put it towards a classic pair of diamond studs! Tiffany's is the best of the best and I've always wanted a pair!!! Thanks Shay so much for posting this give away!!! So awesome!!! I would DEFINITELY get the bracelet!! Ah that would be amazing. Loving Heart bangle. I hope I win! I would def. buy a pretty bracelet to wear as a stack! :) I need to win this! I would buy a nice pair of sunglasses, or a bracelet. If I were fortunate enough to win the giftcard I would buy the Paloma's Calife triple band ring. I've wanted it for a while! I would use it to invest in some classic stud earrings! Thanks so much for this amazing opportunity. I love Tiffany's! Although I own nothing from there. I would get there! I love the Tiffany's twist knot earrings and so much more! I think I would buy some amethyst earrings or those key necklaces are gorgeous, too! What a fun giveaway!! I'd totally get a classic Tiffany's Bracelet. Thanks for the opportunity gals ;]! I'd purchase the 1837 interlocking circles necklace. And then I'd probably pick something out for my mom with the leftover money. I would love to own something from them, it's every girl's dream I think! the 1837 ring in rose gold, gorgeous and simple! Awsome giveaway! I love Tiffany's!! There is a charm bracelet that I have been wanting, so I would definitly get that. I would like a nice extravagence I normally wouldn't get for myself.